Motivated by MaraNatha — . Let me fess up to a few neurotic habits I’ve committed to while I was on a health kick — Preparing all my food without oil or salt. Bringing my own meals to parties. Eliminating fruit except apples and berries. Counting my almonds. I was borderline insane and 100% not living life. Eating food that is delicious and more importantly satisfying around the clock is what keeps my on track today. Nut butters give you that fatty satisfaction and protein to keep you full. 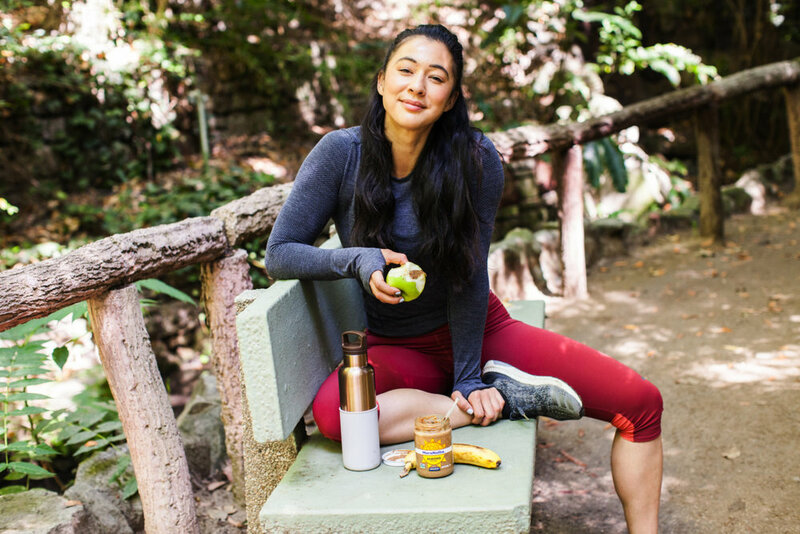 I am thrilled to partner with Mara Natha to share how nut butters are easy to travel with, quick to fill you up and satisfy both your sweet and savory cravings. Here are my favorite MaraNatha recipes that keep me motivated throughout the day. Most mornings I barley have time to brush my hair and let’s be honest, a lot of these healthy breakfast bowls and smoothies require so many dang ingredients it’s just too much to think about while running out the door. My go to for a busy week is throwing together a couple jars of almond butter swirl overnight oats on a Sunday night. You can add fruit, jam, chocolate, protein powder, the list goes on make them but here are the basics, no measuring involved! I’m sure I’m not the only one who likes to eat nut butter by the spoonful and dip anything from apples to pretzels to fig newtons right into the jar. To slow my roll on polishing off an entire jar in one sitting I mix coconut milk (thicker dip) or almond milk (thinner dip). Easier than making powerballs and cleaner than eating a packaged protein bar, these energy bites take 10 seconds tops to throw together. In a pinch or before I work out I grab a pitted date, smear some MaraNatha almond butter on it and sprinkle bee pollen on top. The date gives you the natural sugar, almond butter protein and fat, and bee pollen for B vitamins! Boil a pot of water for your brown rice pad Thai noodles, rice or any other grain. Prepare as advised on packaging. Slice your favorite veggies so they’re similar in size - I used spiralized zucchini, mushrooms, peppers, broccoli and broccoli slaw. Heat vegetable oil or coconut oil and 1 clove of garlic minced. Sautee veggies until soft. Add protein and noodles to cooked veggies. To save time, I buy a rotisserie chicken (no salt option is best), shred the meat. For a vegetarian/vegan version, add cubed tofu.